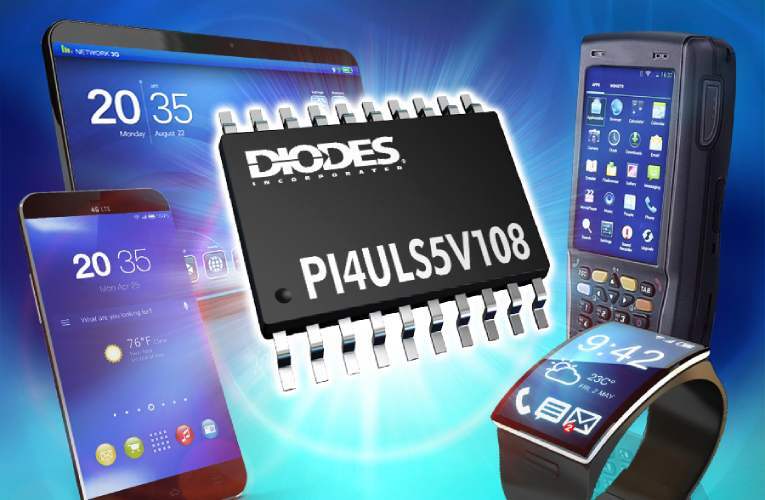 Diodes Incorporated announced an 8-channel, high speed, bidirectional level shifter PI4ULS5V108 designed for inter-IC communications between devices operating on different voltage supply rails. The device is intended to be used in applications such as PC, servers, networking, telecom, and consumer electronics. The PI4ULS5V108 supports up to 100MHz up-translation and greater than 100MHz down-translation at ≤30pF capacitive load. This allows it to support a wide range of PC or consumer interfaces including GPIO, MDIO, SDIO, UART, SMBus, PMBus, I2C, and SPI. It provides voltage level shifting without direction pin control, which minimizes system effort. The level shifter operates between <0.9V and 5V across eight I/O channels, each of which can be configured with different voltage translation levels for system flexibility. Moreover, the on-resistance is very low, yielding minimal signal distortion, while the wider translation voltage range of the PI4ULS5V108 suits consumer interfaces. Enable and I/O pins are ESD protected (8kV HBM and 1kV CDM). The 8-bit PI4ULS5V108 is available in the 20-pin TSSOP or 20-pin VQFN 2.5mm x 4.5mm packages.